"The Leonard Peltier International Tribunal on the Abuse of Indigenous Human Rights will tell our stories with a focus on the last 40 years,” said Dorothy Ninham--a former Oneida Nation judge and founder and director of Wind Chases the Sun. Leaders from many Native struggles will be there to witness about “fishing rights, the sterilization of Indigenous women, extreme poverty, theft of tribes' natural resources, environmental issues and their impact on Indian reservations, the horrific rate of suicides among Native children, and the wrongful conviction of Leonard Peltier (specifically the events that led up to the June 26, 1975, incident at the Pine Ridge Indian Reservation in South Dakota and the effects on survivors of this period),” the organizers state.On Oct. 2 through Oct. 4, the U.S. government will be put on trial for “malfeasance in Indian Country,” according to a statement released at a press conference Sept. 4. 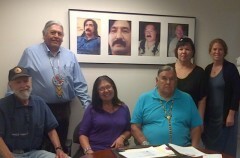 Witnesses are being subpoenaed to appear in Oneida, Wisconsin for the three-day tribunal entitled “The Leonard Peltier International Tribunal on the Abuse of Indigenous Human Rights.”Comment: For more on Leonard Peltier, see Leonard Peltier Day Proclaimed and The Book that Inspired Beach.